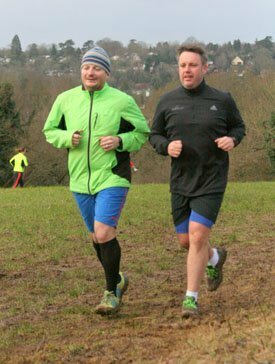 Riddlesdown parkrun this week in our quest to become Lon-done. Only 5 parkruns inside the M25 for me to complete and they’re all the awkward locations that we’ve been diligently ignoring. Thankfully Riddlesdown is easily accessible via the M25 so the mileage may have been high but the journey remained under an hour. No need to get up early for this one – result! We made the effort to recce the course and check out conditions so both managed to bring a selection of trail shoes and spare clothes. That didn’t stop me from making a poor shoe choice though. I took my ‘proper’ trail shoes and my ‘hybrid’ trail shoes. One for gnarly bog like conditions and the other for mud where there’s hard/tarmac sections as well. I knew it was muddy, I knew it was all trail, and I knew it was wet. However, I based my footwear choice on the fact that my hybrid shoes had been stuffed into a bag after Rushmere parkrun a few weeks back and had a smell that could down an elephant from 100 metres. My twisted logic held that traipsing round Riddlesdown would help clear the stink. Not that my proper trail shoes would give me a more suitable grip. Muppet. We huddled near the start line, me trying to use Other Dan as a wind break. Unfortunately he’s not wide enough so I gave up on that cunning plan. Thankfully there weren’t many announcements and we were all off and running. I’m fat & unfit and he’s easing back into running after injury. That means a slow run with lots of chatter and generally taking the piss out of each other. The majority of this run consisted of us moaning about the soft conditions, how cold it was, and trying to avoid getting our feet wet. We must be getting old because previously we’d have been busy trying to splash muddy water at each other. The course really was soft all the way round. Some might say playful. I say annoying. My stupid shoe choice afforded no grip so one sharp term, up an adverse camber, saw me sliding back downhill behind Other Dan as he quite rightly laughed. I then slipped my way on uneven ground around the puddles and this played merry havoc with my feet. On the second lap I had to limp for a few seconds because the sole of my foot hurt so much. The finish funnel finally appeared as the soft ground continued to frustrate us. A couple of *ahem* more mature runners took the opportunity to gracefully pass us wheezing hippos. 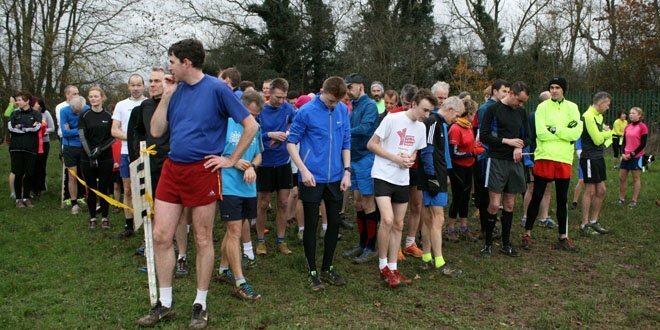 We let them take their hollow victory in the safe knowledge that parkrun isn’t a race. Neh neh ner ner neh! We both felt it at the end. Easy effort but tough conditions. Some cake at the end softened the edges from our run. We were both clearly worn out as we walked back to the car while our warm tops & trousers languished back near the finish area. I then drove out the car park with the boot of the car open. Thank you to the driver behind who beeped us back into our senses. A quick dash back to the course to retrieve our gear and then we were back round the M25 to home.